There are plenty of tarpon on the northern Caribbean coast, and judging from reports from operators on the Pacific, there is all the action you can handle most anyplace you can get a line in the water. On the Caribbean, Dan Wise reports from the Rio Colorado Lodge that Carrie Minnick and Rob Gollahon, from Virginia, fishing two days jumped four tarpon and the largest to the boat was over a hundred pounds. Dan said Jeanine and Michael Freitz, from New Jersey, in two three-hour afternoon sessions jumped 10 tarpon and boated 3, while Mississippi angler John in one day jumped three tarpon and boated two. And the action on the Pacific seems to be improving every day. Karl Angersbach and his gang of six from New Jersey were back in Costa Rica on their annual visit last week, fishing again with my son Rick on the Kingfisher, the Flamingo II and Permt III out of Playa Carrrillo, and their timing couldn´t have been better. Karl fished on the Kingfisher, taking top honors with five marlin, a bunch of sails and, of course, the ever plenituful dorado. "I have landed a number of striped marlin in the past few years, but on Day 1 of this trip, I finally caught my first blue marline and aded another on th last day, with both taken on the Kingfisher," he said. They even even asked my grandaughter Kerry along on the last day in an efforrt to get her her first marlin. The two anglers nailed a stipe and a blue, with Kerry up next, but unforturnately the bite died in the aftenoon and they didn´t see another fish. Sounds like Kerry doesn´t have any better luck than her grandpa. Must run in the family. Reports indicate that the fishing continues at a torrid pace all along the Pacific coast. Kent Maliowski reports that his Los Sueños based skipper and boat rescued a sinking American-owned boat out of Los Suenos Marina in the middle of the night, 30 miles offshore about a week ago. For more information, contact Kent on his cell at 888-4851. I tried to reach him for details, but no anwer. Never did get the final resorts of the Harry Grey Fly Fishing tournament out of Quepos or the other tournament scheduled last week out of Los Sueños Marina. From Dominical, Nick fortney of Cost Rica Hooksetters said they are raisibng four to eight sails a day, with free-jummpes and surface swimmers everywhere. Most of the fish are from 14 miles to 30 miles out. Nick said Rhode Island angler and skipper Lynn Smith released a large sail after a number of raises and Lou Remado, from New York also scored. “This week so far we have raised six to eight every day and released fi ve. . .and while dorado fishing is good, the people want the sails,” he added. Capt. 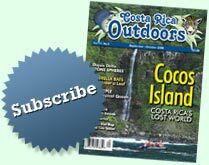 Mark Corn, of Southern Costa Rica Sportfishing, on the southermost coast writes via email that on January 24 he and Keith Kelly had an experience that he had never seen in 13 years chartering off the southern coast. “We were three miles off the rock of Matapalo and had four big marlin in the spread at once,” he said. “We manged to hook three, and in one hour, released one that would have run 400 pounds, another 300 pounds, and broke the leader on the third,” Mark said, adding that they also released three sails and were back at the eocks by 1 p.m. For more information, contact Mark at osacapt@hotmail.com or go to his website atwww.costaricasportsman.com Local telephone number is 735-5292. Skippers, lodge operators and anglers are invited to contact Jerry personally at his office in Santa Ana with fishing reports by noon Monday of each week on email at jruhlow@racsa.co.cr or call 282-6743.